Do cottons rule your wardrobe? Then, a shopping spree at Fablore, just off Commercial Street, is well warranted. Prices begin at INR 165 per metre. A couple of years old, Fablore is for those of you who love cottons and cutomised outfits. Located a few doors down from Safina Plaza, the store greets you with stacks of fabric placed right at the enterance. You can pick through a large selection of cottons in pastels (made prettier with delicate floral pattern), or the traditional paisley or the abstract prints. 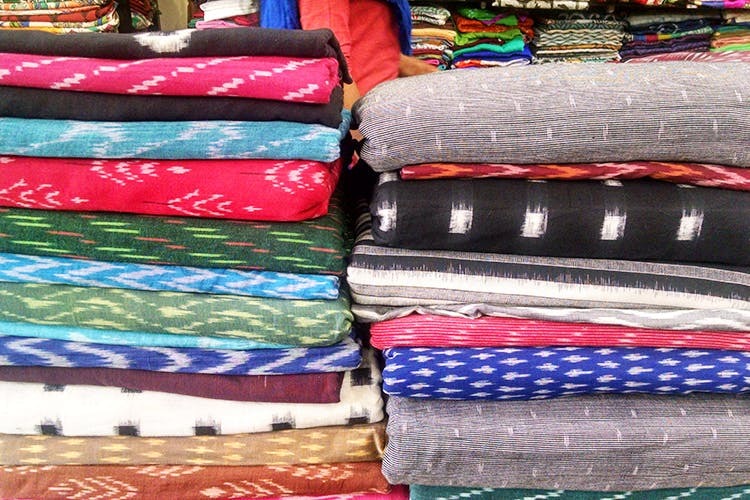 These are perfect for your kurtas or even simple dresses that’ll keep things breezy on a warm day. But the stacks that shine the brightest are the ones with ikat and Kalamkari prints. Prices start at about INR 165 but if you want to splurge on the real deal we recommend you go for the higher-end ones that cost about INR 595 (the prints are also less run of the mill). The store also stocks Dabu and Arjakh prints. Plus those gorgeous Sanganeri prints on breathable mul fabrics. Not in the mood for DIY? Then, choose from their racks of skirts (the ones with contrasting borders are particularly gorgeous) and simple tops that are perfect for daily wear. They also have a lovely collection of sarees starting at INR 895 and you can even pick up readymade blouses at the store.